In our previous article, we detailed how to commission your promo video. So now that you’ve got a promotional video at your dispense, how do you get the most from it? Well, the answer is simple: reuse your content on various marketing channels, at different points of your product life cycle as well as your customers purchase journey. Online videos are undoubtably a powerful repurposing tool. A promotional video serves many business objectives and is therefore ideal for repurposing throughout your marketing campaigns to help achieve them. 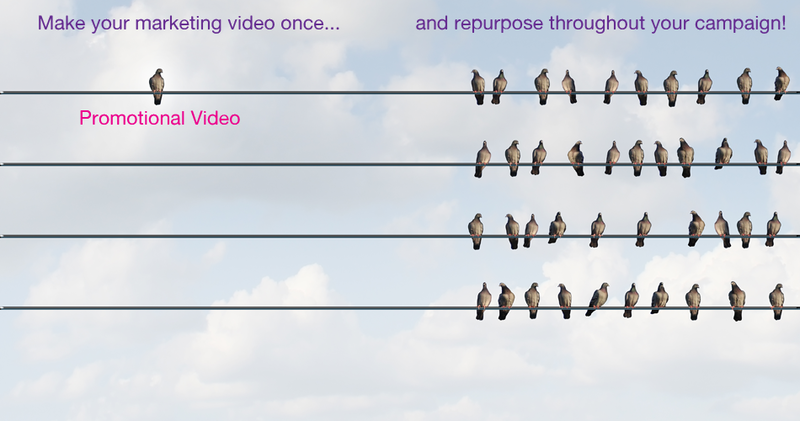 In fact, it is one of the most cost effective types of video around because of it’s potential to be reused. Social Media: A promo video is basically a 24/7 marketing tool. Pin it to the top of your brand page so it’s the first thing users see when they check it out. A great introduction to your brand and the perfect portal for sending interested customers directly to your website. In Emails: Promos act as click-through bait for your emails too. People would rather watch a video to get to know your brand/products than read a bunch of text, and the same goes for emails. The internet is a fast paced environment and if you’re lucky enough to grab your audiences’ attention, you won’t have it for very long. On Landing Pages: A Promo on your landing page reinforces your brand message, key competitive advantages and unique selling points. Perfect for adding to pages specifically aimed at turning interests into conversions. On your Homepage or Website in general: When placed onto your main website, a promotional video adds a personal touch and improves user experience. You will see this through a higher page duration and a lower bounce rate. A promo video on your homepage can also be used to direct your customers to specific pages on the site where they can purchase products and services. An interactive video would be ideal for this, view our first attempt at interactive video content, here. Promotional videos are ideal for launching your product and drumming up interest when your target audience has little to no awareness of who you are or what you do. At a time when your marketing spend is at its highest and you’re experiencing a rise in competition, a promo is a cost effective way to create and maintain a buzz around your product. Use it to communicate your competitive advantage as well as your brand message at this stage. Find out how a promotional video can be used throughout the whole lifecycle, here. A promo promotes both your brand and products, and it is highly shareable – great for drumming up interest and is highly shareable on social media. This helps raise awareness and can eventually increase brand preference – a unbeatable competitive advantage. The same video can be used to give a deeper understanding of your company and values to push your potential customer along the purchase funnel. A talking head within the promo can help to give authority and credibilty to your brand and calls to action in this form are highly persuasive. At a time where your potential customers are comparing you with your competition, a great promotional video can make you stand out and catch their attention. If your promo shows off your product well enough, it could be all that’s needed to remove doubts from the consumer minds and entice them to purchase from you. Having a quality promotional video on your landing pages can increase someone’s intent to buy by as much as 97% and improve brand association by 139%, according to a study by Unruly. 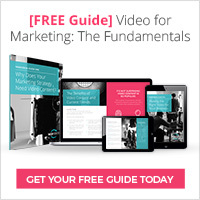 You can learn how to use ALL types of video throughout your customer journey, here. Or view our customer journey infographic.